American International Group, Inc. – also known as AIG – is an American multinational insurance corporation with over 63,000 employees globally. AIG companies serve customers in more than 130 countries around the world; the company is a provider of property casualty insurance, life insurance and retirement services, and mortgage insurance. AIG’s corporate headquarters are in New York City, its British headquarters are in London, continental Europe operations are based in La Défense, Paris, and its Asian headquarters are in Hong Kong. According to the 2013 Forbes Global 2000 list, AIG was the 62nd-largest public company in the world. As of February 20, 2014, it had a market capitalization of $73.11 billion, per FactSet. 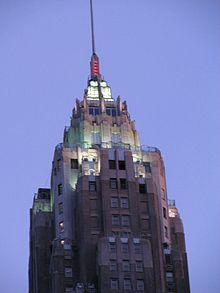 The American International Building on 175 Water Street, New York City. In 1960, C.V. Starr hired Maurice R. Greenberg to develop an international accident and health business. Two years later, Mr.Greenberg reorganized one of C.V. Starr’s U.S. holdings into a successful multiple line carrier. Greenberg focused on selling insurance through independent brokers rather than agents to eliminate agent salaries. Using brokers, AIU could price insurance according to its potential return even if it suffered decreased sales of certain products for great lengths of time with very little extra expense. In 1967, American International Group, Inc. (AIG) was incorporated as a unifying umbrella organization for most of C.V. Starr’s general and life insurance businesses. In 1968, Starr named Greenberg his successor. The company went public in 1969. The 1970s presented many challenges for AIG as operations in the Middle East and Southeast Asia were curtailed or ceased altogether due to the changing political landscape. However, AIG continued to expand its markets by introducing specialized energy, transportation, and shipping products to serve the needs of niche industries. By 1979, with a growing workforce and a worldwide network of offices, AIG offered clients superior technical and risk management skills in an increasingly competitive marketplace. During the 1980s, AIG continued expanding its market distribution and worldwide network by offering a wide range of specialized products, including pollution liability  and political risk. In 1984 AIG listed its shares on the New York Stock Exchange (NYSE). Throughout the 1990s, AIG developed new sources of income through diverse investments, including the acquisition of International Lease Finance Corporation (ILFC), a provider of leased aircraft to the airline industry. In 1992, AIG received the first foreign insurance license granted in over 40 years by the Chinese government. Within the U.S., AIG acquired Sun America Inc. a retirement savings company, in 1999. The early 2000s saw a marked period of growth as AIG acquired American General Corporation, a leading domestic life insurance and annuities provider, and AIG entered new markets including India. In February 2000, AIG created a strategic advisory venture team with the Blackstone Group and Kissinger Associates "to provide financial advisory services to corporations seeking high level independent strategic advice." AIG has been an investor in the Blackstone Group since 1998 and just recently sold all of its' shares in the company, which was also an adviser for them during the '07-'08 financial crisis. On October 14, 2004, the New York State Office of Attorney General Eliot Spitzer announced that it had commenced a civil action against Marsh & McLennan Companies for steering clients to preferred insurers with whom the company maintained lucrative payoff agreements, and for soliciting rigged bids for insurance contracts from the insurers. The Attorney General announced in a release that two AIG executives pleaded guilty to criminal charges in connection with this illegal course of conduct. In early May 2005, AIG restated its financial position and issued a reduction in book value of USD $2.7 billion, a 3.3 percent reduction in net worth. On February 9, 2006, AIG and the New York State Attorney General's office agreed to a settlement in which AIG would pay a fine of $1.6 billion. Beginning in 2005, AIG became embroiled in a series of fraud investigations conducted by the Securities and Exchange Commission, U.S. Justice Department, and New York State Attorney General's Office. Greenberg was ousted amid an accounting scandal in February 2005; he is still fighting civil charges being pursued by New York state. The New York Attorney General's investigation led to a $1.6 billion fine for AIG and criminal charges for some of its executives. Greenberg was succeeded as CEO by Martin J. Sullivan, who had begun his career at AIG as a clerk in its London office in 1970. After Greenberg left, AIG took on tens of billions of risk associated with mortgages. It insured tens of billions of derivatives against default, but did not purchase reinsurance on that risk. Secondly, it used collateral on deposit to buy mortgage-backed securities. When losses hit the mortgage market in 2007-8, AIG had to pay out insurance claims and also replace the losses in its collateral accounts. On June 15, 2008, after disclosure of financial losses and subsequent to a falling stock price, Sullivan resigned and was replaced by Robert B. Willumstad, Chairman of the AIG Board of Directors since 2006. Willumstad was forced by the US government to step down and was replaced by Edward M. Liddy on September 17, 2008. AIG's board of directors named Robert Benmosche CEO on August 3, 2009 to replace Mr. Liddy, who earlier in the year announced his retirement. AIG faced the most difficult financial crisis in its history when a series of events unfolded in late 2008. The insurer had sold credit protection through its London unit in the form of credit default swaps (CDSs) on collateralized debt obligations (CDOs) but they had declined in value. The AIG Financial Products division, headed by Joseph Cassano, in London, had entered into credit default swaps to insure $441 billion worth of securities originally rated AAA. Of those securities, $57.8 billion were structured debt securities backed by subprime loans. As a result, AIG’s credit rating was downgraded and it was required to post additional collateral with its trading counter-parties, leading to a liquidity crisis that began on September 16, 2008 and essentially bankrupted all of AIG. The United States Federal Reserve Bank stepped in, announcing the creation of a secured credit facility of up to US$85 billion to prevent the company's collapse, enabling AIG to deliver additional collateral to its credit default swap trading partners. The credit facility was secured by the stock in AIG-owned subsidiaries in the form of warrants for a 79.9% equity stake in the company and the right to suspend dividends to previously issued common and preferred stock. The AIG board accepted the terms of the Federal Reserve rescue package that same day, making it the largest government bailout of a private company in U.S. history. On January 21, 2009, it was announced that AIG would not be renewing its sponsorship of the Manchester United Soccer club at the end of the deal in May 2010. On March 17, 2009, AIG announced that they were paying $165 million in executive bonuses, according to news reports. Total bonuses for the financial unit could reach $450 million and bonuses for the entire company could reach $1.2 billion. President Barack Obama, who voted for the AIG bailout as a Senator responded to the planned payments by saying "[I]t's hard to understand how derivative traders at AIG warranted any bonuses, much less $165 million in extra pay. How do they justify this outrage to the taxpayers who are keeping the company afloat?" and "In the last six months, AIG has received substantial sums from the U.S. Treasury. I’ve asked Secretary [Timothy] Geithner to use that leverage and pursue every legal avenue to block these bonuses and make the American taxpayers whole." Politicians on both sides of the Congressional aisle reacted with outrage to the planned bonuses. Political commentators and journalists expressed an equally bipartisan outrage. Due to the Q3 2011 net loss widening, on November 3, 2011, the AIG shares plunged 49 percent year to date. The insurer's board approved the share buyback of as much as $1 billion. The U.S. Department of The Treasury in December 2012 published an itemized list of the loans, stock purchases, special purpose vehicles (SPVs) and other investments engaged in with AIG, the amount AIG paid back and the positive return on the loans and investments to the government. Treasury said that it and the Federal Reserve Bank of New York provided a total $182.3 billion to AIG, which paid back a total $205 billion, for a total positive return, or profit, to the government of $22.7 billion. In addition, AIG sold off a number of its own assets to raise money to pay back the government. Reported in January 2011, AIG sold its Taiwanese life insurance company, Nan Shan Life, to a consortium of buyers for $2.16 billion. May 7, 2012. Treasury announced an offering of 188.5 million shares of AIG for a total of $5.8 billion. The sale reduced Treasury’s stake in AIG to 61 percent, from 70 percent before the transaction. September 14, 2012. The Treasury completed its fifth sale of AIG common stock, with proceeds of approximately $20.7 billion, reducing the Treasury’s ownership stake in AIG to approximately 15.9 percent from 53 percent. Government commitments were fully recovered, and Treasury and the FRBNY to date had received a combined positive return of approximately $15.1 billion. December 14, 2012. Treasury sold the last of its AIG stock in its sixth stock stale for a total of approximately $7.6 billion. As a result of these sales, the U.S. Government and America fully recouped their investment in AIG, plus a total combined positive return of more than $22 billion.